Change your desktop wallpaper with the Desktop & Screensaver preference pane. Screen shot courtesy of Coyote Moon, Inc.
You can change your Mac’s desktop wallpaper from the standard Apple-supplied image to almost any picture you care to use. You can use a picture you shot with your camera, an image you downloaded from the Internet, or a design you created with a graphics application. Changing the desktop's wallpaper is one of the easiest ways to customize your Mac, It ensures everyone knows this is your Mac, different from all theother Mac's using the standard wallpaper supplied by Apple. Desktop wallpaper pictures should be in JPEG, TIFF, PICT, or RAW formats. Raw image files are sometimes problematic because each camera manufacturer creates its own RAW image file format. Apple routinely updates the Mac OS to handle the many different types of RAW formats, but to ensure maximum compatibility, particularly if you’re going to share your pictures with family or friends, use JPG or TIFF format. You can store the pictures you want to use for your desktop wallpaper anywhere on your Mac. One way to stay organized is to create a Desktop Pictures folder to store your collection of images and place that folder within the Pictures folder that the Mac OS creates for each user. In addition to creating pictures and storing them in a special folder, you can use your existing Photos, iPhoto or Aperture image library as a source of images for desktop wallpaper. Ever since OS X Leopard (OS X 10.5) the Mac has includes these libraries as pre-defined locations in the system’s Desktop & Screen Saver preferences pane. Although it’s easy to use these image libraries, it's a good idea to copying the pictures you intend to use as desktop wallpaper to a specific folder, independent of your Photos, iPhoto or Aperture library. That way you can edit images in any of the image libraries without worrying about affecting their desktop wallpaper counterparts. In the System Preferences window that opens, click the Desktop & Screen Saver preference pane. In the left-hand pane, you’ll see a list of folders that have been pre-assigned for use as desktop wallpaper. You should see Apple Images, Nature, Plants, Black & White, Abstracts, and Solid Colors. You may see additional folders, depending on the version of the Mac operating system you’re using. Click the Choose Folder item in the left-hand pane. Select the folder by clicking on it once, then click the Choose button. Near the top of the sidebar, you will notice a preview of the selected image and how it will look on your Mac's desktop. Just to the right, you will find a popup menu containing options for fitting the image to your desktop. You can try each option and see its effects in the preview. Some of the available options can cause image distortion, so be sure and check the actual desktop as well. 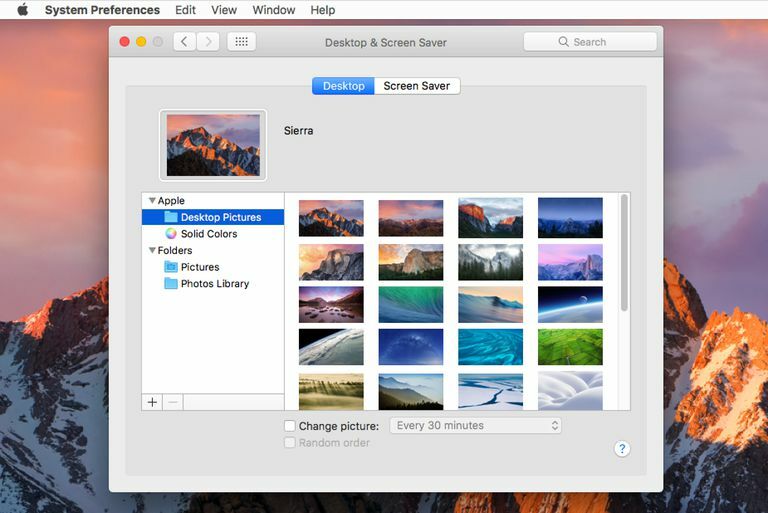 If the selected folder contains more than one picture, you can choose to have your Mac display each picture in the folder, either in order or randomly. You can also decide how often the images will change. Put a check mark in the Change picture box. Use the drop-down menu next to the Change picture box to select when the pictures will change. You can choose a predefined time interval, ranging from every 5 seconds to once a day, or you can choose to have the picture change when you log in, or when your Mac wakes from sleep. To have the desktop pictures change in random order, put a check mark in the Random order checkbox. That’s all there is to personalize your desktop wallpaper. Click the close (red) button to close System Preferences, and enjoy your new desktop pictures.